This photo taken near the railroad tracks, you can see the curve to the right in the distance. Past there is the 4 corners mentioned below. The white building on the right is or was post office, store, etc. ; and the next red house must have been the Putnams. The gravel spot on the left, across from store appears to be access to station foundation. It was a pretty little village where everyone was friendly and neighbors helped each other. As you approached from Richville by the railroad tracks on each side was a large platform where they loaded and unloaded milk and cream from the Borden Plant in Richville. The railroad station was called Richville and a horse and buggy driven by Evan Reese and his dog met the mail train each day and took any passengers who needed a ride to Richville. On the right side of a gravel road was the general store, post office and home of the owners, Leonard and Mix. Next came the house of Joel Putman and Jim Putman and family, he ran the blacksmith shop behind, next was Cuminghams then Clarion Leonard and Greenhills. My father built our home and I was born there (although it wasn't finished), August 14, 1913. Next came Frank Biche who had a chicken business and sold eggs. Mrs. Cole lived next and then Frank Reed, grandfather of Erie Reed, who had a small farm. The Lime Kiln was up at the curve with pits behind and I can recall the older men keeping the fire burning and spinning tall tales. The Besaw family lived at the 4 corners. On the left was the depot, freight office, coal sheds, and cattle yards. ( Then came the feed mill and lumber yard. Mr. Love (see below) ran the mill and lived next door. They had one daughter, Minetta, who married a Brown from Gouverneur who was a minister. Lew Bishop was next, he was the station agent, next was Owen Jones, his wife Rachel was always on hand if someone was ill (a caring lady). Their daughter was Anna Jones Dickerson, a teacher. Beyond them was Mr. and Mrs. Heath an elderly coup1e who was cared for by Rose Tripp who walked from Richville each day to care for them. Beyond them was grandpa William Scott (a Civi1 war veteran). Around the curve was a two room school house. Anna Jones and Edith Gardner taught there. Bennett Jones lived at the 4 corncrs, also Mr. Parker and Manley Johnson. As there was no hospital nearer than Ogdensburg or Watertown, any serious case was loaded on a cot and put in the baggage car and sent by rail. My father, who was a painter on the system, made several of these trips. Babies were delivered at home with the help of midwives, Mrs. Jones and Effie Reed helping Dr. Allen. We had pot luck suppers, card parties, and picnics. When in high school we walked to Richville if we didn't catch a ride with a milk rig. We attended the congregational church, cross circle (a women's group), mens brotherhood, sunday school, and Christian Eneavor. The Bishops were the first to have an automobile and radio. As the Mrs. was a little deaf we all could hear the news from KDKA because in nice weather she kept the set on the front porch. 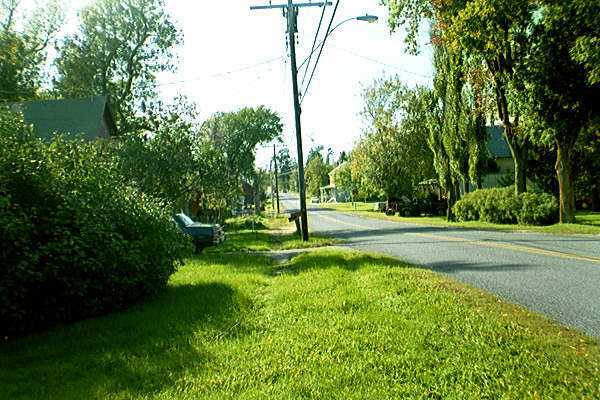 The picket fences, cedar hedges, side walk, and maple trees are all gone now. The creek is filled in and years ago they dammed it up and cut ice for Borden's Ice House across the tracks, they used it in the milk cars for refrigeration. It is no longer the pretty, quiet place I remember. It is a mess. These are some of links for this family Edwin E. 8(Dexter E. 7 ,Moses Foster 6,John 5, John 4, Joshua 3, Joshua 2, John 1), BIGELOW. This Newspaper clipping is from ca 1900. 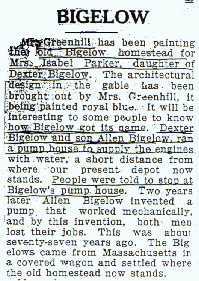 He also writes: Florence Greenhill Bigelow was the wife of Elwin L. Bigelow; son of Elwin M. Bigelow son of William Hubbard Bigelow. Elwin and Florence lived in Richville. Elwin died in 1996 and Florence died last year. Their son David lives on Main Street Richville. My interest in the Hamlet of Bigelow is that we live at the second house on the right from the Bigelow four corners on Boland Road. My grandparents lived on Gimlet Street (country Rt 18), and my mother went to school in the two room school house that Florence mentions in her article. 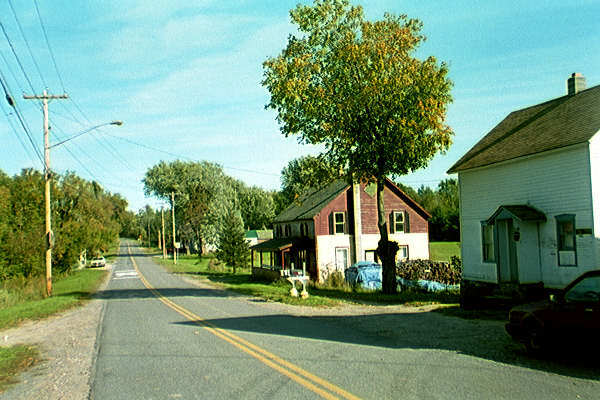 The photo above and below were taken in the Hamlet in the early fall of 1997 by ROD. The photo below is taken from the curve looking towards the railroad tracks and Richville. 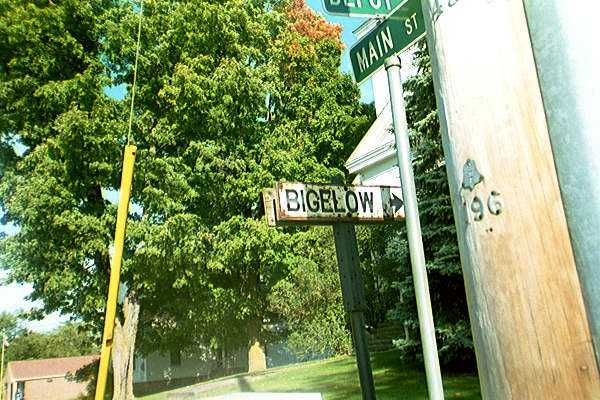 There are no signs as you enter "Bigelow" from either direction. There is only the sign in Richville in front of the Church that directs you to BIGELOW, and that is the bottom picture. Great site. Just read the page "Bigelow Hamlet". The Mr. Love mentioned therein is my Great Uncle.